INGREDIENTS: Flakes of Parmigiano Reggiano and Traditional Balsamic Vinegar of Modena. Arrange the flakes of Parmigiano Reggiano on plate and pour a few drops of Traditional Balsamic Vinegar of Modena on each. INGREDIENTS FOR 6 :500 g. garganelli egg pasta;100 g. diced smoked bacon;250 g. cooking cream; 6 spoonful of Traditional Balsamic Vinegar of Modena. Fry the bacon in a non-stick pan and when the fatty part has almost melted, add the cream and, after a few minutes, the Traditional Balsamic Vinegar of Modena. Cook the pasta, drain it well then add to the sauce. Blend the ingredients together. 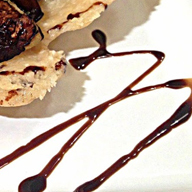 Serve and few drops of Traditional Balsamic Vinegar of Modena to each portion. INGREDIENTS FOR 4 SERVINGS : 6 eggs;50 g. grated Parmigiano Reggiano chees;50 g. chopped onion;oil as required; butter as required;10 g. Traditional Balsamic Vinegar of Modena. Whisk the eggs with the grated Prmigiano Reggiano cheese in a bowl. Allow the onion to brown slightly with a knob of butter in a pan, then add the eggs, season with salt to taste and mix well. Pour the oil into a frying pan and heat. Now place spoonfuls of the egg mixture into the boiling oil to form cakes. Brown them on both sides. Place the cakes on kitchen paper to eliminate the excess oil, then arrange them on a serving dish and pour a few drops of Traditional Balsamic Vinegar of Modena on each. Serve hot. Surprising results are obtained on ice cream and tropical fruit, strawberries and peaches. The territoriality and potentiality of the gastronomy of the province of Emilia is revealed by the combination of Traditional Balsamic Vinegar of Modena with flakes of Parmigiano Reggiano cheese, in the same way as Brittany oysters manifest their universality and right to occupy a very important position amongst the gastronomic products of the world. A spoonful of "Balsamico Tradizionale" makes an unusual and most original aperitif as well as help digestion at the end of a meal.